This "Hearing (L'Ouie) III" tapestry, part of the Lady and the Unicorn series of tapestries “La Dame a la Licorne”, shows the sense of hearing. Here the mysterious lady is shown playing the pipe organ with her maid by her side listening. They are flanked by the lion on the left and the unicorn on the right. They are further surrounded by the royal emblems of Jean Le Viste and a thousand flower background with forest creatures, invented and used in 16th and 17th century art in France. The original series of complete tapestries were commissioned to celebrate Jean Le Viste’s appointment to King Louis XI’s court. His daughter, Claude, possessed the tapestries after the death of Jean. Today, the original series are shown in the Musee National du Moyen Age in Paris. 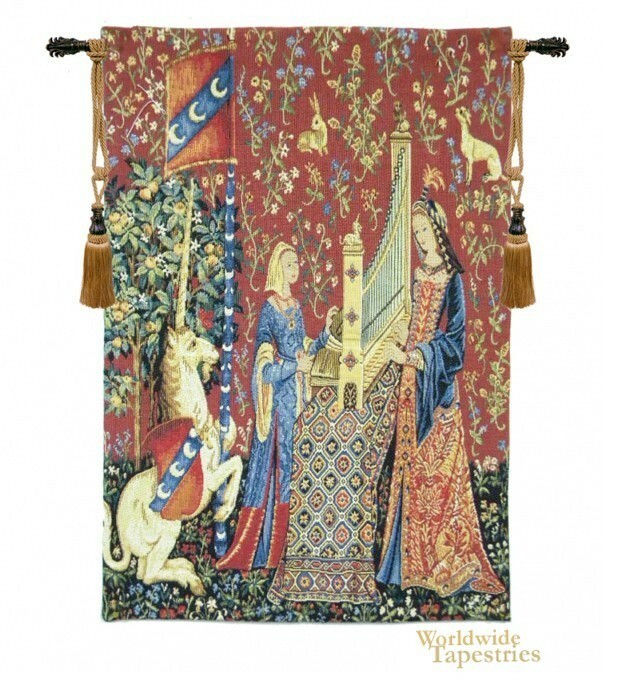 This lady and the unicorn tapestry "Hearing (L'Ouie) III" is lined on the back and has a tunnel for easy hanging. Note: tapestry rod and tassels, where pictured, are purchased separately.